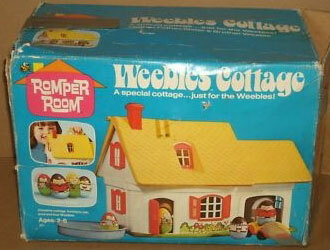 Description: The Weebles Cottage was the 2nd Weebles playset introduced by Hasbro Toys (1972's #595 Car & Camper was the 1st). The large cottage has a garage and a "slate" roof with windows to look through. The roof flips up and the frpnt wall swings open to play inside the cottage. 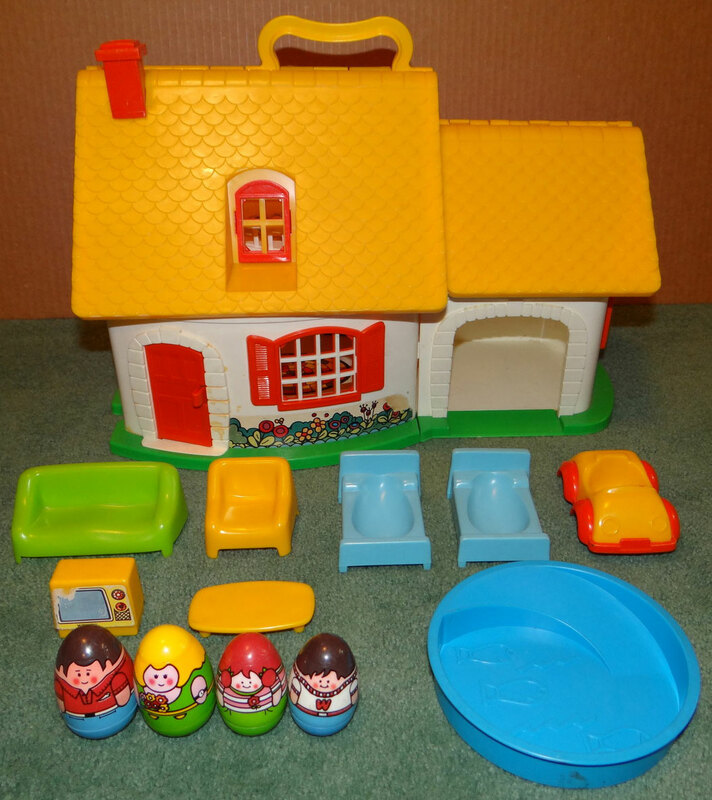 The set includes a car, swimming pool, furniture and a family of 4 Weebles (peelable - no plastic cover to protect the Weeble's body). 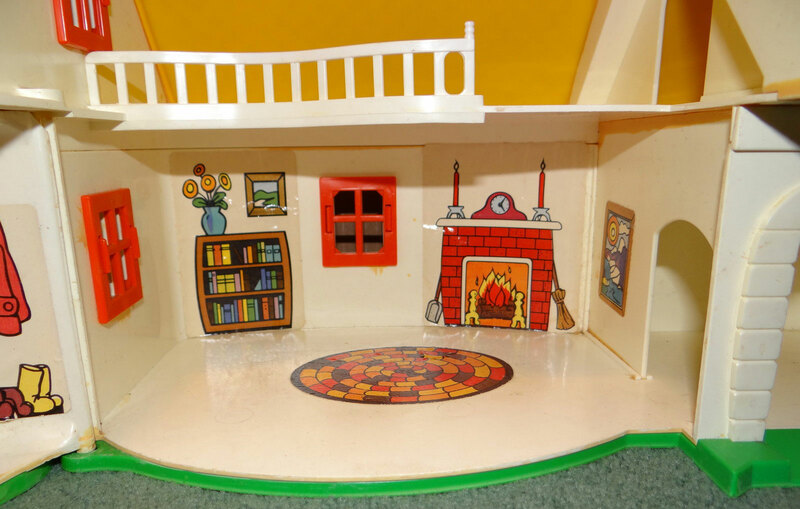 The cottage was modified and reintroduced in 1977 as the Sears Exclusive Winnie-the-Pooh Weebles Playhouse at Pooh Corners. 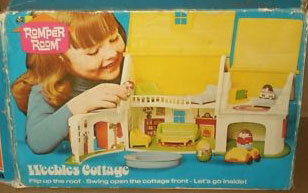 The cottage was modified again and reintroduced as the #592 Weebles Playhouse in 1981. 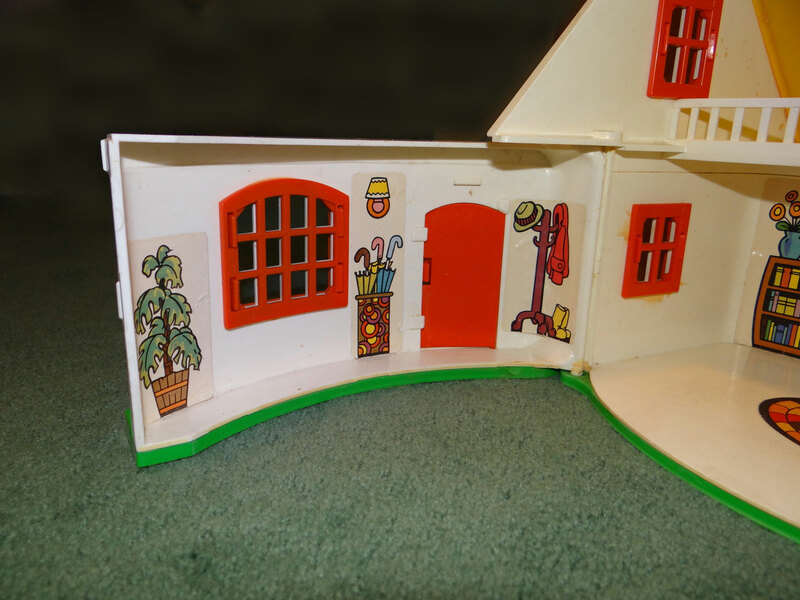 House - HTW124 - White plastic 2-story house with a green base and a yellow roof. The roof has two sides: large roof area with a carry handle on top, and a small roof area (located above the garage). Both roof pieces are hinged to lift and allow play inside the house. The front wall of the house (with front door and bay window) is also hinged, but only opens 90 degrees. 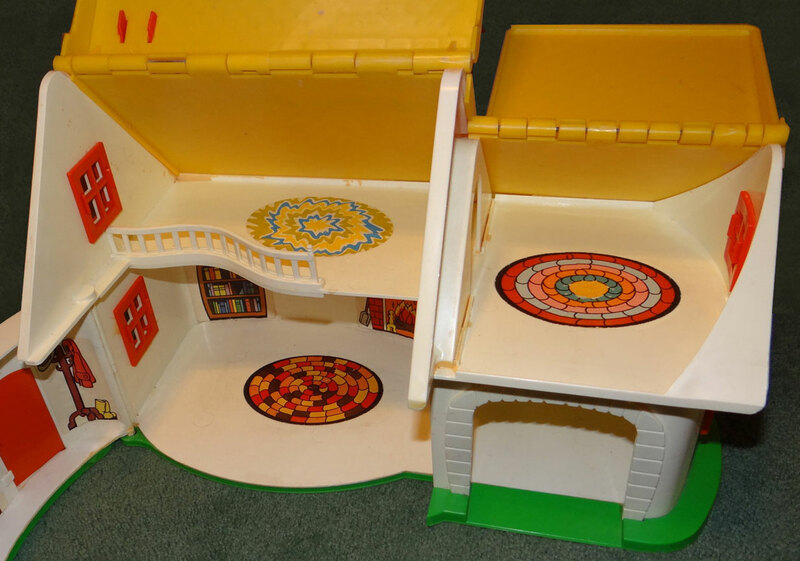 Bottom side of roof flaps and bottom of base are marked, "©1973 Hasbro". 1 each - Chimney - HTW125 - Small squared orange chimney with a square top and an angled base with 2 attachment arms (to attach to the Cottage roof). 1 each - Door - HTW126 - Orange door with a raised molded "handle" on the front side. The top of the door is slightly arched, top half of door has 3 small rectangular recessed "decorative panels" and bottom half of door has 2 large recessed rectangular "panels". 1 each - Large Window - HTW127 - Large orange plastic window frame, slightly curved top, shutters on each side. 4 each - Medium with Shutters Window - HTW128 - Square orange window frame with an orange arched top and shutters on each side. 1 each - Medium w/o Shutters Window - HTW129 - Square orange window frame with an orange arched top (no shutters). 1 each - Small Window - HTW130 - Small square orange window frame with shutters on each side. 1 each - Balcony Rail - HTW131 - White curved balcony handrail: 2 curved horizontal rails connected via 14 short vertical support tails. Top edge of one end of the rail has a round "decorative" finial. 2 each - HTW132 - Light blue bed marked, "©1973 Hasbro" on the bottom. Bed has a tall headboard, short footboard, and recessed egg-shaped bedtop (to allow Weeble figures to lay down). 1 each - HTW133 - yellow 1-seat sofa chair with molded arm rests and 4 short corner "legs". 1 each - HTW134 - green 1-seat sofa chair with molded arm rests and 4 short corner "legs". 1 each - HTW135 - green 2-seat sofa couch with molded arm rests and 4 short corner "legs". 1 each - HTW136 - Yellow oval-shaped coffee table with 4 short legs on the bottom. 1 each - HTW137 - Squared yellow TV with a litho on one side of a blank TV screen and 2 control knobs. Car - HTW138 - Yellow top, orange base 1-seat car. Bottom of car is marked, "©1973 Hasbro®". Swimming Pool - HTW139 - Round blue kiddie pool with a molded-in slide on one side and molded fish and water wave designs on the inside bottom of the pool. Bottom of the pool is marked "1973 ©Hasbro®". HTW5 - Dad - Blue base, brown top (hair), red shirt with cuffs and collar. Marked "©1973 Hasbro". Measures 2" tall. HTW6 - Mom - Green base, yellow top (hair), green shirt, holding flowers. Marked "©1973 Hasbro". Measures 2" tall. HTW7 - Girl - Green base, red top (hair) girl with pink/white striped shirt. Marked "©1973 Hasbro". Measures 1-3/4" tall. HTW8 - Boy - Blue base, brown top (hair) boy with white shirt with red/white cuffs and collar, red belt, and red "W" on his chest. Marked "©1973 Hasbro". Measures 1-3/4" tall. Featured in 1973 Eatons Christmas Book (pg. 461) - $9.99. Featured in 1974 JcPenny's Christmas Book (pg. 325) - $9.99.